← Some good stuff about LIN ! At CES Intel announced both Lenovo and Motorola would be bringing Atom based smartphones to market in 2012. Lenovo showed off its K800 for the China market at the show, while Motorola offered a more vague commitment to bring multiple devices to market starting later this year. Today Intel announced its next Atom/Medfield customer: Orange. A French Telecom brand, Orange is one of the world’s largest mobile network carriers. The nature of the partnership with Intel is quite unique – Orange will be selling a co-branded version of Intel‘s Medfield reference design platform, effectively cutting out any branded device manufacturer and going direct to customers with Intel‘s platform. As a recap, at CES Intel announced the Atom Z2460. The Z2460 SoC is the first incarnation of Medfield, although more versions are expected. Intel‘s new Mobile and Communications Group, under the leadership of Mike Bell (formerly of Apple and Palm), developed a consumer-class reference design for Medfield. Mike and his team wanted to be able to show potential customers that Medfield could be used in something that was smartphone sized, while delivering excellent performance and battery life. The result was the Medfield FFRD (Form Factor Reference Design). Unlike other mobile reference designs, Intel‘s Medfield FFRD is not just indicative of what the underlying hardware can do but it’s also a polished phone that is apparently good enough to be sold directly to end users. Intel‘s customers are free to take the FFRD and tweak it in whatever way they see fit, or come up with an entirely new design of their own based on Intel silicon. Intel‘s belief is that by delivering a reference platform that can actually be used and sold, it allows its customers to focus more on software/differentiation, rather than building a reliable, well tested smartphone motherboard. Lenovo‘s K800 is based on Intel‘s FFRD although with an obviously customized chassis and software stack. Motorola‘s devices on the other hand will likely be significant departures from Intel‘s reference design. The partnership with Orange is unique because Orange will be selling Intel‘s FFRD directly to its customers with Orange and Intel branding on the phone. The device will be supported by Orange and it’s codenamed the Orange Santa Clara (homage to Intel‘s HQ in Santa Clara, CA). The Santa Clara doesn’t use the same FFRD we saw at IDF and CES, but rather a newer, thinner version (pictured above). The outer dimensions remain unchanged, however the new FFRD is now a constant 9.99mm while the previous design varied between 9.99mm and 10.99mm in thickness. The new FFRD is also slightly lighter at 117g vs. 127g. Most of the remaining specs remain the same however. 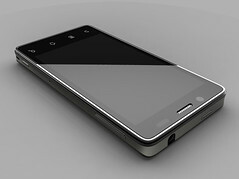 It has an Atom Z2460 SoC, 1GB of LPDDR2 memory and uses Intel‘s XMM 6260 HSPA+ (21/5.7Mbps) baseband. The display measures 4.03-inches and has a native resolution of 1024 x 600 with 1080p HDMI out. Hardware accelerated 1080p video encode and decode are both supported. The Santa Clara will ship with Gingerbread although Orange and Intel are committing to an Ice Cream Sandwich upgrade “soon”. We’ve already seen ICS running on the Medfield FFRD, so the Gingerbread launch is likely more to do with timing than anything else. The Orange partnership gives us insight into Intel‘s plans as a player in the phone space. First, it hints at Intel‘s desire to be a part of more vertically integrated plays. By selling Orange an entire reference design, Intel presumably avoids the trap of being simply a low margin SoC provider. By going direct to a carrier, Intel avoids one thing it has struggled with for most of Atom’s career: winning over device vendors. Granted with the Motorola announcement at CES, those days are now behind Intel, but as Intel‘s first major announcement of MWC I get the feeling that we won’t see any other Motorola-like announcements at the show. More device vendors are sure to come, but Intel going direct with a carrier offers a unique business opportunity for both parties. 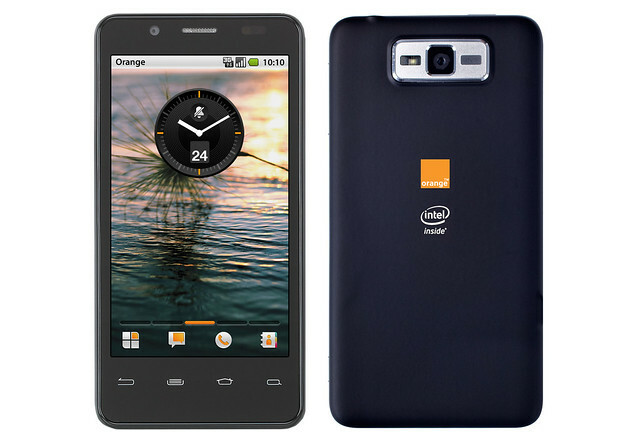 Intel gets to quickly expand its potential market, while Orange gets to sell a very solid phone under its own brand. The value for Orange obviously depends on how good the reference platform is. Intel claims its Android stack is the most reliable in the industry and the FFRD should reflect that. We’ll find out in due time of course. The second thing we can gather from Intel‘s Orange partnership (and previous announcements) is its current region focus. While I fully expect to see North American plays from Intel, it’s clear that the company sees initial opportunities in Europe and Asia. If i had to guess at why, I’d say it’s likely iPhone related. Although Intel needs marketshare, it also needs revenue to make its mobile business make sense. It’s possible Intel views the iPhone as less of a threat in Europe and Asia, and thus it makes sense to focus there first. For end users whether or not this is a significant victory remains to be seen. Carriers are typically untrustworthy when it comes to being given control of the software stack on a smartphone (admittedly, neither are most device OEMs). Orange plans on delivering a stock Android experience with its own apps, games and widgets preloaded on the device. The more tempting possibility is one that I’m not sure Intel is feeling risky enough to explore, at least not in 2012. Selling its reference design through a carrier is one thing, what I really want to see is Intel selling the reference design, unlocked, to consumers directly. Intel already has branded motherboard and server businesses that easily coexist with competing businesses from Intel‘s own customers, there’s no reason it can’t do the same with smartphones. I suspect Intel is more interested in appeasing carriers and device vendors today and thus it wouldn’t make sense to announce intentions to compete directly with them, but I do hope that we’ll eventually see this option explored. This entry was posted in Technology, Wireless, Work and tagged Android, Atom, baseband, CES, 英特爾, FFRD, Form Factor Reference Design, French Telecom, GB, Gingerbread, Google, HSPA, Ice Cream Sandwich, ICS, Intel, K800, Lenovo, Medfield, Mediatek, MOTOROLA, MWC, Orange, Own Brand, Qualcomm, reference design, Santa Clara, smartphone, SoC, XMM 6260, Z2460. Bookmark the permalink.